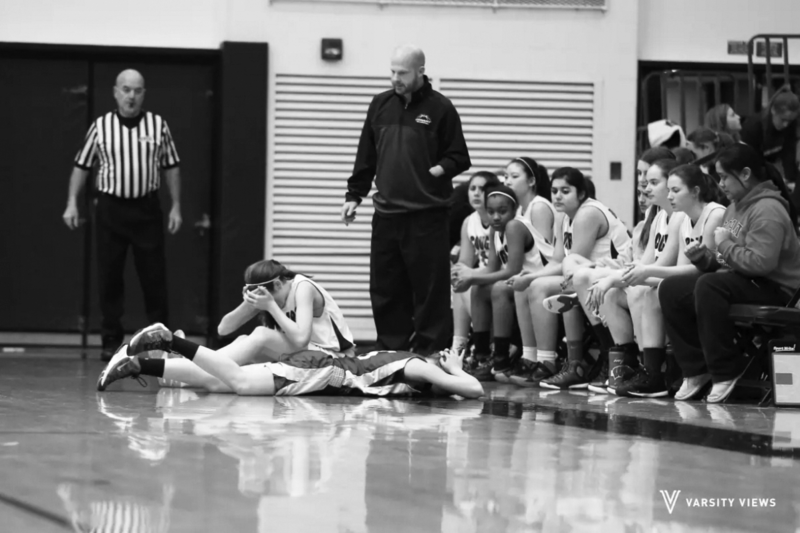 CONCUSSION DISCUSSION: Lying face down on the basketball court during a game on Jan. 13, sophomore Lauren Meier struggles with a head inury, later diagnosed as a concussion. By the next school year, Illinois middle and high schools must fit concussion management to state standards, according to the Youth Sports Concussion Safety Act. Illinois middle and high schools will be required to adjust their concussion management to state standards, by the 2016-2017 school year, as mandated by the Youth Sports Concussion Safety Act. The act’s regulations had originally planned to be fully made official at the beginning of 2016, but the implementation was pushed back when Governor Bruce Rauner approved amendments on Nov. 20, 2015. According to Tony Catsaros, head athletic trainer, while South had a majority of the necessary components in place prior to the enactment, postponing the law probably helped other schools. “[The push back] is great, because then all these other schools that may not have had all the […] pieces in place [now] have time,” Catsaros said. According to the Illinois High School Association (IHSA) website, the act requires concussion policies to be compliant with all IHSA guidelines including return-to-learn and return-to-play policies. Catsaros explained that the two policies are followed in order to get a student active again after a concussion. The duration for recovery depends on each student, but he also believes the programs at South help students catch up on work in order to make the transition easier. Senior Erica Gelman got her first concussion during a soccer game when she was elbowed in the head. Unaware of her injury, Gelman was diagnosed with a concussion two days later, which took two months to heal. She went through the return-to-learn recovery program. The new law also orders use of IHSA-provided educational materials on head injuries, creation of a Concussion Oversight Team (COT), training for all coaches and licensed officials and development of an emergency action plan for serious injuries that could rapidly deteriorate a student’s condition, Catsaros said. He also revealed that GBS will have to face few changes as a result of the act, since GBS had already fulfilled a majority of its requirements. Another adjustment that will need to be made is the appropriate distribution of emergency action plans—written last year—as mandated by the act, according to Catsaros. They are currently hung in athletic sites in the building next to emergency exit procedures. More plans will be added to outdoor locations during the upcoming spring sports season. The added physician, anticipated to be in place by the end of the spring, will have direct involvement with the recovering process for students. Catsaros says this will be the most noticeable change for students suffering from a concussion since the passage of the act. “[The students will be able to see] the physician for evaluation or clearance, but [there will also be] an athletic trainer working under the direction of the physician,” Catsaros said. Mike Noll, assistant athletic director, sees the addition of a new physician as another important factor in the recovery process for students.